I've got FTTC and BT Checker says I can get FTTP but can't find any ISP doing this yet? I'm guessing if you already have FTTC then it is FTTPod you can get? Not aware of being able to get full FTTP and FTTC, but possibly wrong. Confirms what's been said, you've got FTTC and can have FTTP if you are prepared to pay for it - the initial cost could be very high. As has been said, FTTPoD is probably going to be expensive. In addition to a fixed installation fee of £500, a distance based construction charge will also apply, reflecting the costs of building a fibre network direct to a customer�s premise. In line with what we�ve said previously, we estimate that more than half of premises will incur a distance based charge of between £200 and £1000. Premises that are further away from the relevant part of the fibre network will incur a higher charge due the extra engineering work involved. It will be up to communications providers to decide whether to pass these charges on to consumers and businesses. The wholesale cost of the FTTPoD installation and connection can be seen in the Openreach price list. For an estimated 54.7/15.7 Mbit/s FTTC connection, I'd estimate the OP to be in Band B - 200 to 400m from the aggregation node (which is likely to be near the cabinet). For Band B, the ISP will have to pay £1100 + VAT installation costs, then £456 + VAT a year for three years for the circuit (you have to take the 330/30 Mbit/s option on FTTPoD). The backhaul and other ISP costs have to be added to this. I'm not sure any ISP offers a retail FTTPoD product, but I'd expect Band B costs in the range of £1320 install (i.e. passing on the entire installation costs) and a minimum of £60/month (and probably, more realistically, £80-100 per month) on a 36 month minimum contract period. BT Retail may offer the cheapest monthly costs, though I believe they are not currently offering FTTPoD on consumer Infinity Option 4 pricing. As can be seen, FTTPoD really is a business product. 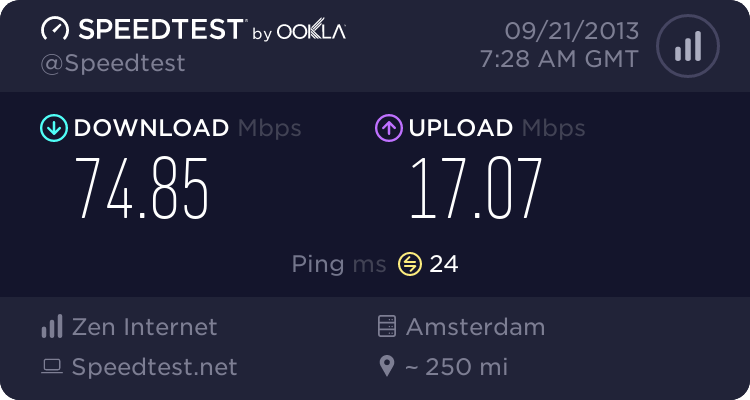 For an estimated 54.7/15.7 Mbit/s FTTC connection, I'd estimate the OP to be in Band B - 200 to 400m from the aggregation node (which is likely to be near the cabinet). Not really the case, the node may actually be a fair distance from the cabinet. Remember the aggregation node is there to aggregate multiple cabinets hence is going to be at a point where it's near-equidistant from a few of them and, logically, on the route back to the handover node. Here's the route between the cabinet currently being built near here and its node - as detailed to me by the guys blowing fibre between them.